Dr. Steven Van Scoyoc, experienced periodontist, offers dental implants in Southern Pines, NC, to new patients with or without a referral. Dr. Van Scoyoc is the only clinician in Moore County with this unique training background and has successfully placed over 600 dental implants. Dr. Steven Van Scoyoc, esteemed periodontist, welcomes new patients for dental implants in Southern Pines, NC, now without a referral. Dental implants are the ideal replacement for missing teeth because of their durability, stability, and natural look and feel. Dr. Van Scoyoc encourages those with missing teeth in the Southern Pines area to receive a custom dental implant consultation to learn how this long-term solution to tooth loss can improve their oral health and smile esthetics. Tooth loss can decrease quality of life and self-confidence, and make it difficult to eat, chew and speak. Without proper stimulation by natural tooth roots, the jaw bone will begin to recede, causing adjacent teeth to shift and facial symmetry to be lost. Dental implants provide patients with many advantages and, with proper care, can be a permanent replacement for missing teeth. Dental implants have a three-part structure: the post, the abutment, and the dental crown. During surgery, Dr. Van Scoyoc gently places the dental implant post into the jaw bone. As the treatment site heals, bone fuses to the titanium post and begins to act much like a normal tooth root. The abutment attaches to the post and provides the base for the dental crown. The dental crown is customized to each patient and colored to match surrounding teeth. Once fully healed, dental implants in Southern Pines, NC, are strong and stable, providing the healthy stimulation to the jaw bone, and looking just like a natural tooth. Patients with severe jaw bone loss may require a bone grafting procedure before receiving their implants. 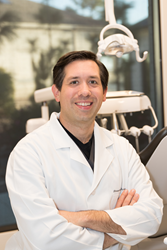 As an experienced periodontist, Dr. Van Scoyoc performs many bone grafting procedures with minimally invasive Piezosurgery®, a revolutionary alternative to traditional techniques. Piezosurgery uses ultrasonic waves to improve the comfort, safety, and accuracy of treatment for patients and prepares them more quickly for the placement of dental implants in Southern Pines, NC. Those in need of dental implants in Southern Pines, NC, are encouraged to call Van Scoyoc Periodontics and Implants Center for Oral Health at 910-692-6270 to schedule a personalized dental implant consultation with respected board-certified periodontist, Dr. Van Scoyoc. Van Scoyoc Periodontics and Implants Center for Oral Health offers experienced periodontal treatments to patients in Southern Pines, NC. Dr. Steven Van Scoyoc is a board-certified periodontist, a Diplomate of the American Academy of Periodontology and the only dental clinician with this unique training in Moore County. Dr. Van Scoyoc offers specialized periodontal services including single and full-arch dental implant care, laser gum disease treatment and gum recession solutions. Dr. Van Scoyoc and his team strive to build long-term relationships with each of their patients allowing them to understand their unique needs and goals. To learn more about Dr. Van Scoyoc, his practice or the services he offers, visit http://www.perionc.com or call 910-692-6270 to schedule a custom consultation.